Diggers Valley: 22 September 2018. The week beginning the 22nd of September 2018. Leaving Demelza in Flat 3, I took Zella out of Flat 2 where she was still on her own, and sent her down along the lanes, ahead of the three cows from Flat 5b. 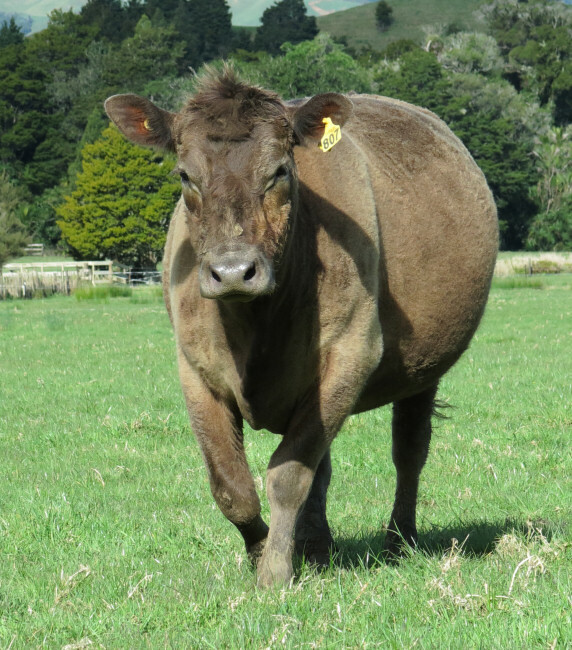 Zella and the other three are the last of the pregnant cows to have their copper injections. I decided not to make Demelza walk so far, since I'm starting to have end of life thoughts about her, so she doesn't really need another copper injection. I had to pop Zella into the little riverbank area and take the other three on to the yards first, since Zella didn't want to go any further on her own. I didn't want them to be all together in case there was fighting. Grey 807, who usually refuses to go up the race, wouldn't even go up into the crush pen where I could have injected her from the catwalk and eventually I had to do her just beside her tail, where there's nice loose skin. She wouldn't let me near her neck with the needle. 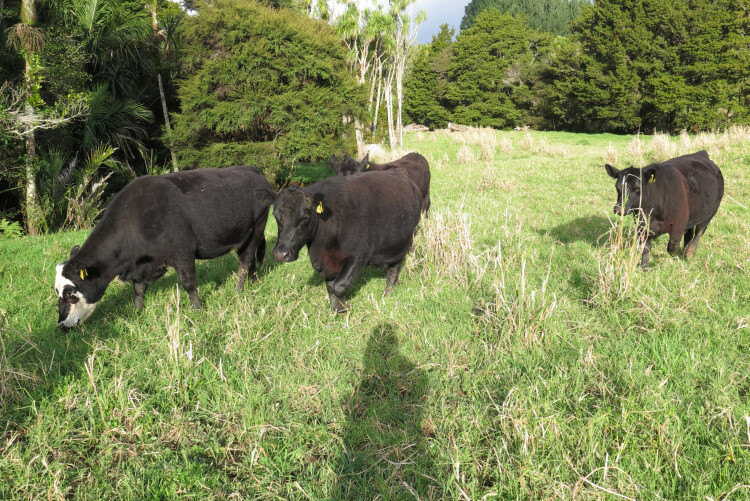 On the way back they stopped and "talked" to the four young heifers in Flat 1. 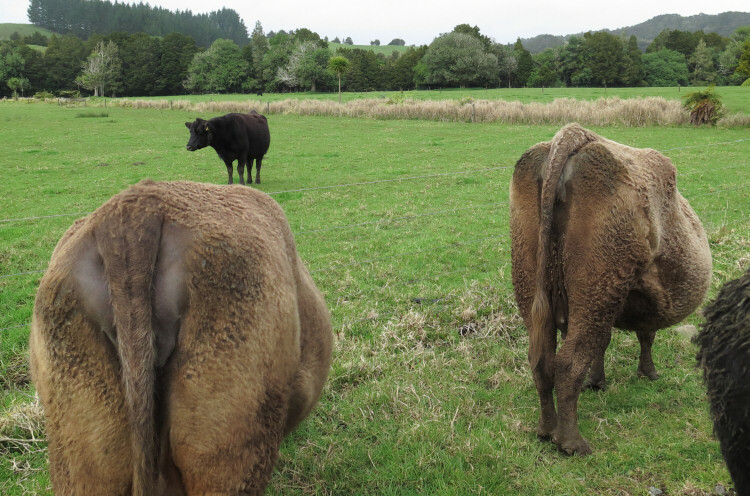 The black animal is 792, Endberly's daughter of 2015. 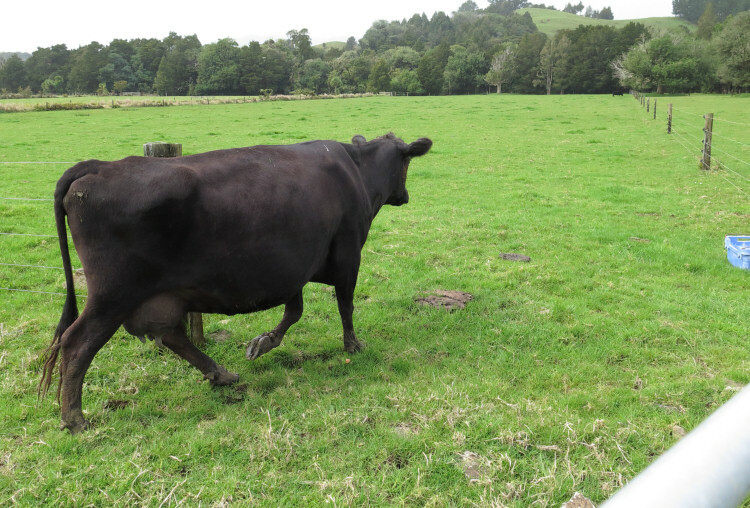 Endberly's calf bulge, out to the right, looks huge in this picture. I wonder what sort of creature she has in there? Zella seemed really anxious to get back to Demelza, looking toward her from every point along the track. 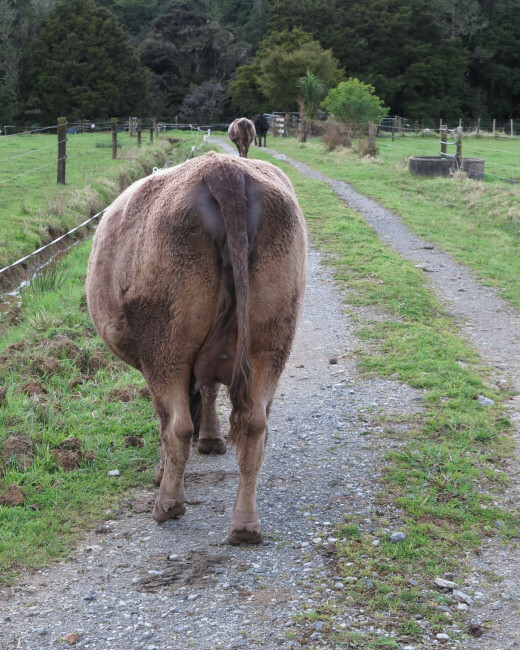 She was distracted enough not to try and interact with the other three cows, when I had to dash ahead of the four of them to open a gate. 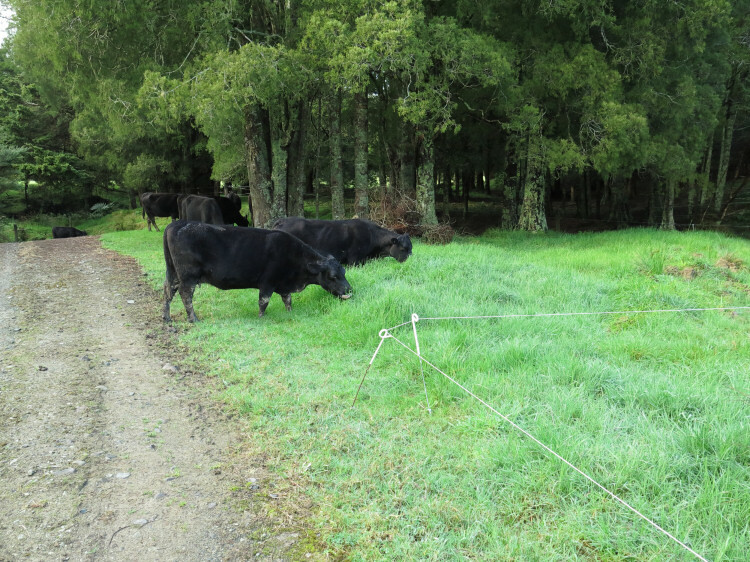 The wet area I put a wire around earlier in the year, at the base of the Pines paddock, felt like it had dried out enough to allow the thin mob to graze it on their way past this morning. They were very happy with some unexpected long grass. We spent the main part of the day in town at another Te W&amacr;nanga one-day session for the Kait&amacr;ia and Taipa te reo M&amacr;ori classes. It's a great opportunity for us all to interact and practice what we've been learning. Every time we meet there are fewer people, some not there because of clashing engagements but a number have dropped out during the year. Life can change a lot in a few months. 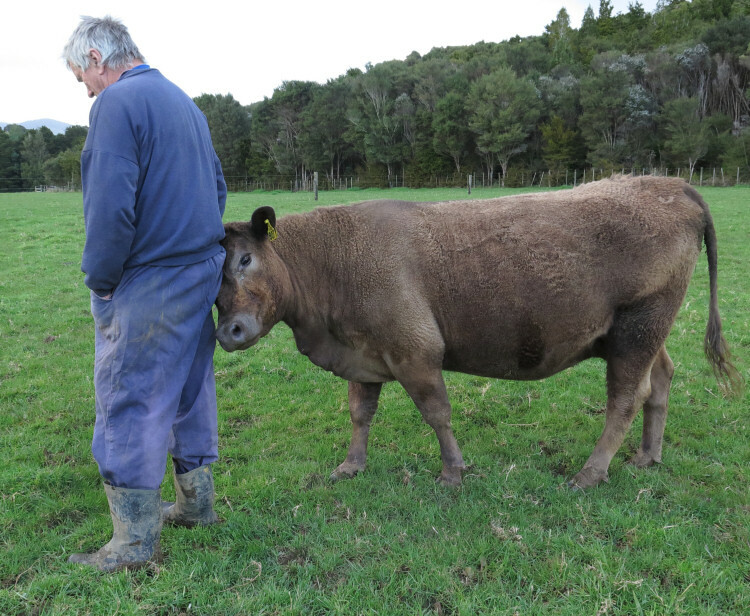 At home again, Kees dropped round to sharpen his shearing gear on Stephan's grinder and while he and Stephan continued chatting over a cuppa, I went off to move the heifers across the stream into the Road Flat, which hasn't been grazed for a few weeks. They were beautifully easy to move, remembering that there's greener grass over here when they're brought down across the stream. We had to leave home by 10.30 this morning for a noon appointment in Kerikeri; but having realised I'd not looked at the orchids for more than a week, I was determined to do that first. Fascinating! 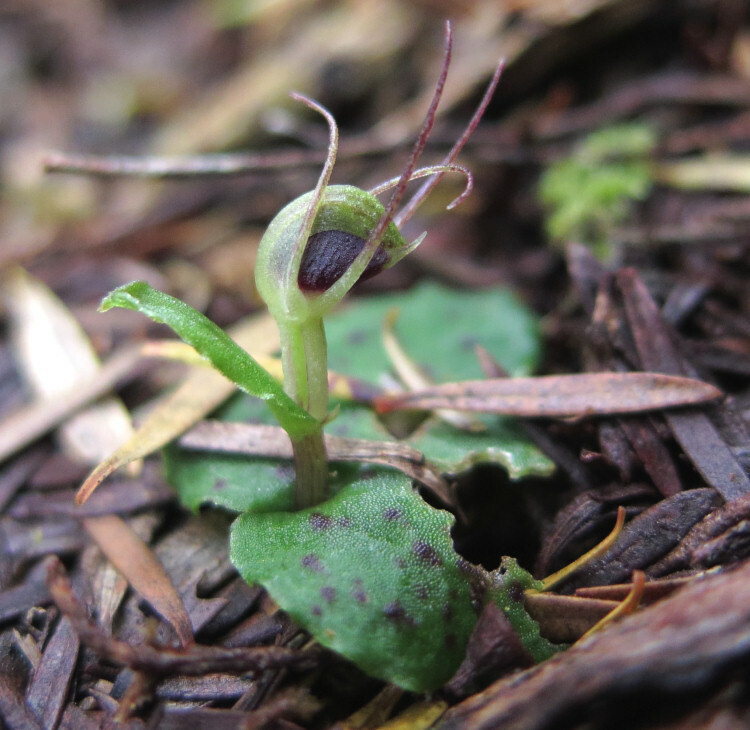 I don't think this flower is fully open yet, from the pictures on the Native Orchids website. I was surprised by how tiny the flowers are. 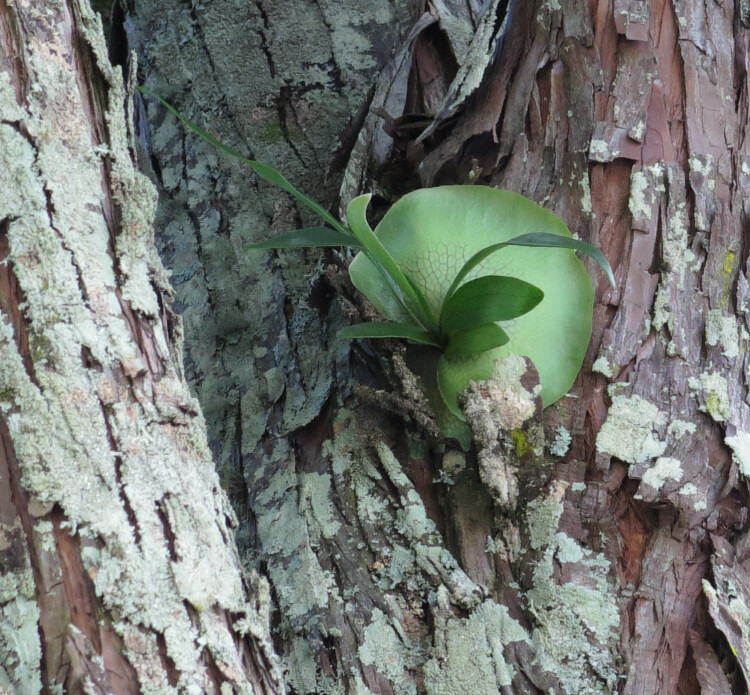 I thought, with such large leaves, they might have larger flowers but they're much tinier than the others of the spider orchid group I've found on the farm. Maybe they'll grow a little in size as they mature? 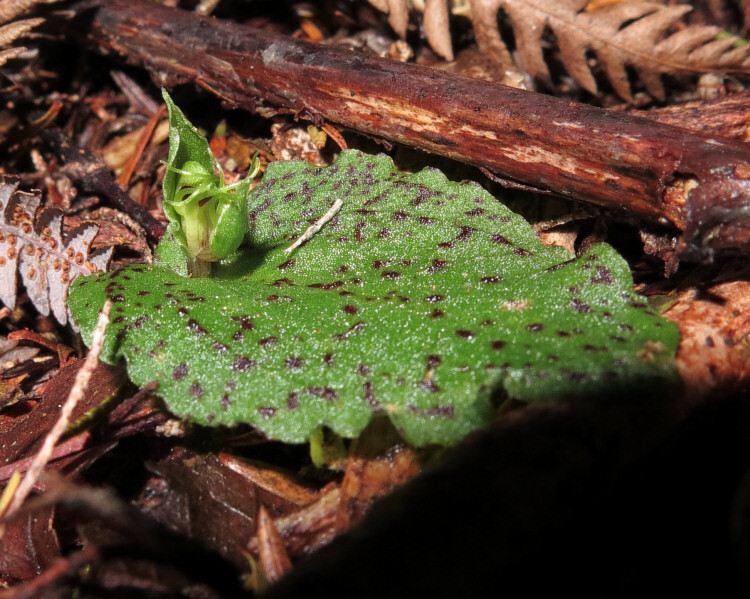 This is the one I have repeatedly photographed: there are two flowers emerging. 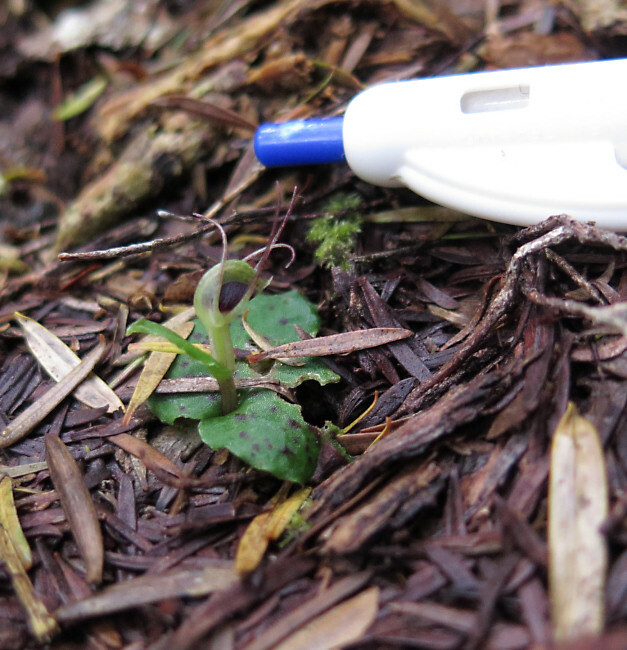 Crazy, tiny things. If you weren't looking for them, you'd never see them. Then we drove to Kerikeri and stopped in a shady spot for a cup of tea and a bit of lunch we'd brought with us. I was strolling around looking at things and noticed this weird thing high up in a Totara tree. 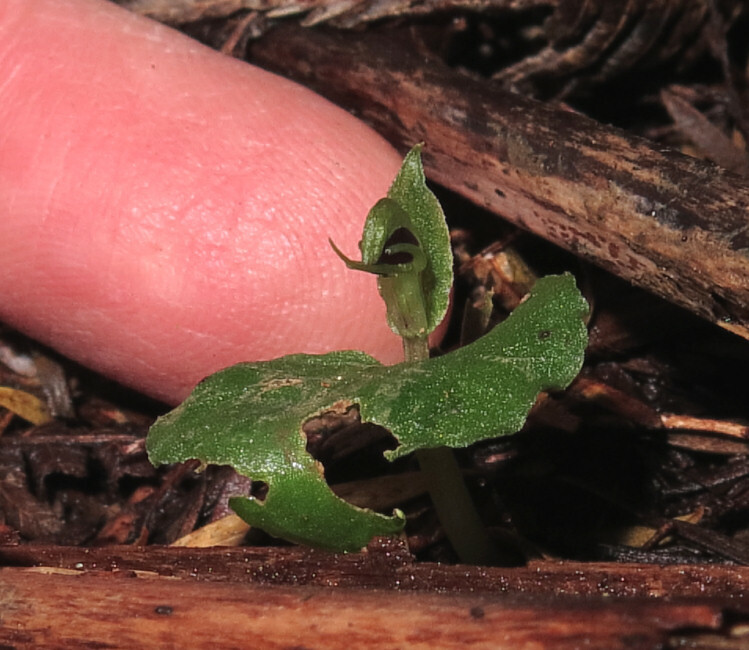 It is an Elkhorn Fern. It must have grown there on its own, being too high in the tree for anyone to have attached it there. An online search found that there's an enormous one down by Kemp House, in a huge old Jacaranda tree. I'll have to go and take some pictures of that! 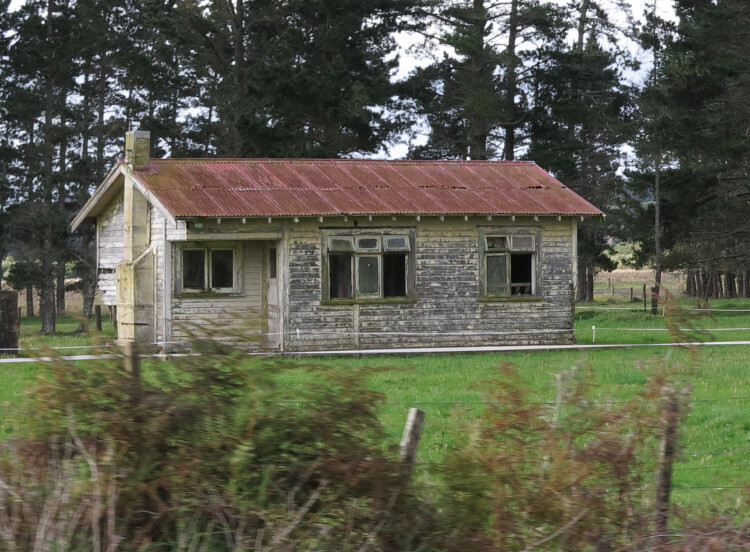 Along State Highway 10 (around the east coast), these old houses have long been falling apart and a few weeks ago on a drive out here, I thought I'd like to bring the camera one day and photograph them, before they collapse or are demolished. 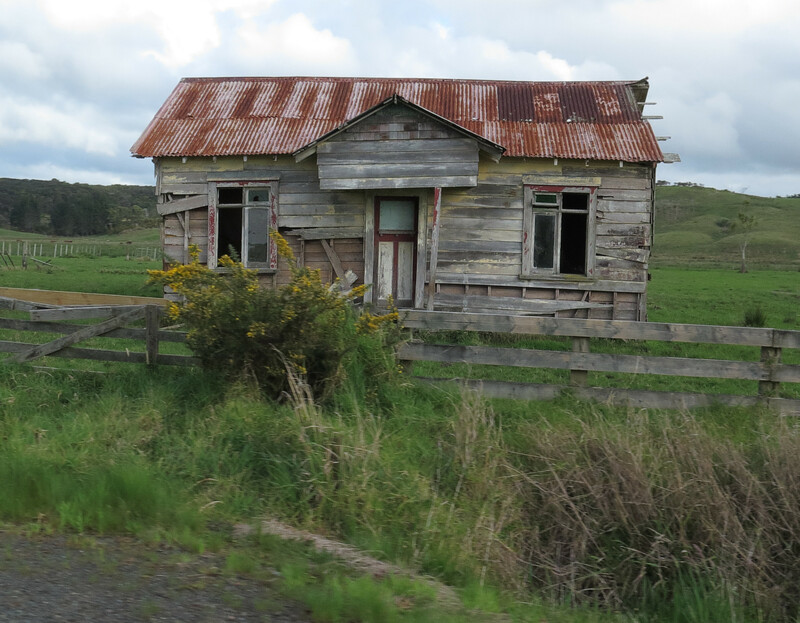 They would have been people's homes in my childhood when we regularly travelled this way to town. We didn't have time to stop today so I decided I'd try some out-the-window drive-by photos and they worked well enough. We dropped in to one of the farm supplies stores and I bought some new gumboots, a brand I'd not heard of before, but which have evenly-spaced treads across the bottom, which might ease the pain I've been feeling in my big toe joint. Cheap gumboots have bands of hard rubber across under the main part of the foot, which can create uncomfortable pressures on susceptible feet. Bearing in mind how far I walk during calving, I figured it was silly not to buy some more comfortable boots than I currently own. Then we went out to Ahipara to the Bayview Restaurant, to surprise Lynn (and not Kees, since he'd suggested it) for her birthday. It was an interesting dinner, a chunk of meat served on a hot grilling stone, to be cut and cooked in small pieces by the diner. It was a rather pleasant way to eat. If we ever go again though, I'll stick to the main course and not buy a desert, which rather expensively undermined the experience. 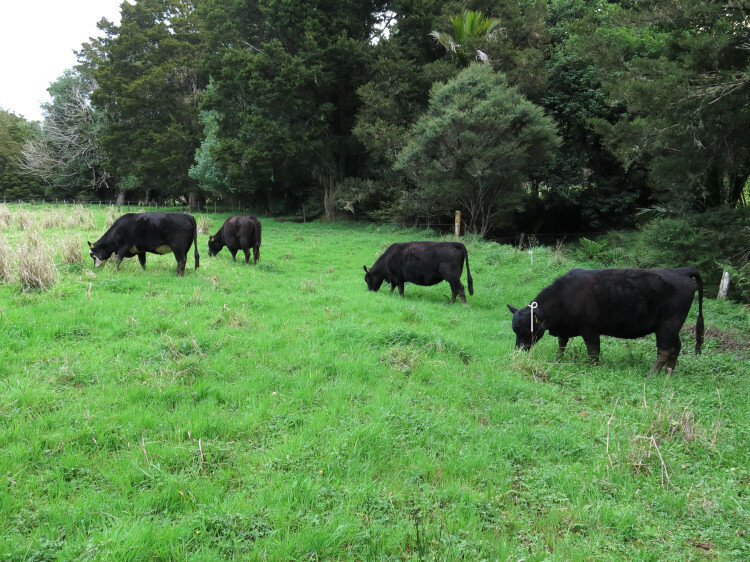 We walked over to check on the heifers in the Road Flat and had a look at the trees in the orchard while we were there. Here is some nearly-blossom on a pear tree. 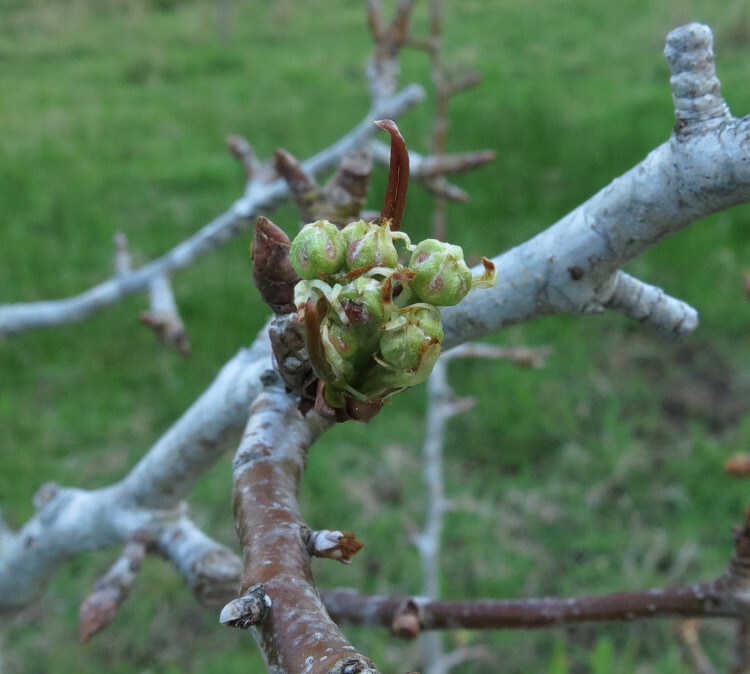 Quite a few of the apple trees have new leaves. The heifers followed us back, looking like they thought we might take them with us but then got distracted by enough grass to eat and lost interest in us. When Stephan walked away, she followed, prompting more. I suggested we don't let her make this a habit or she'll bowl me over one day. 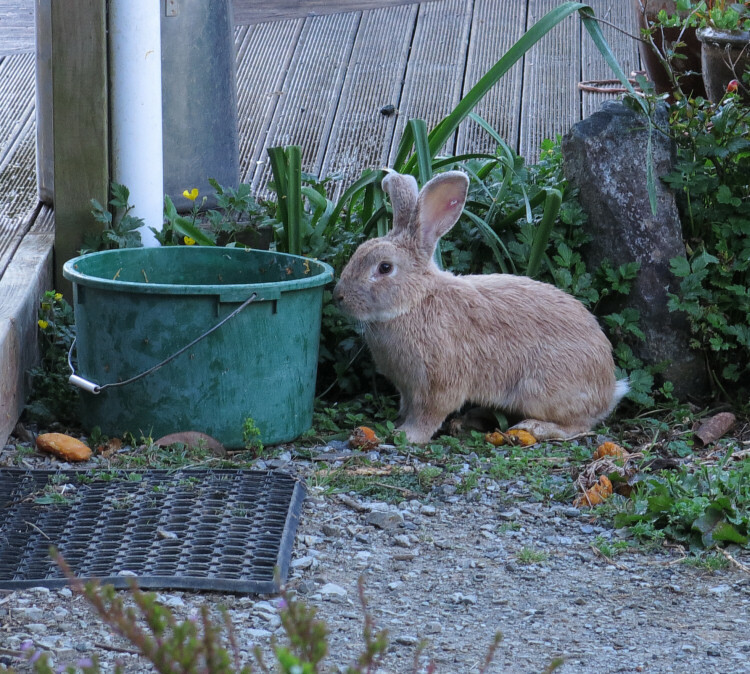 The rabbit has discovered this bucket, containing a lot of squeezed grapefruit skins, upon which we found it feasting a couple of mornings ago. Here it is again. 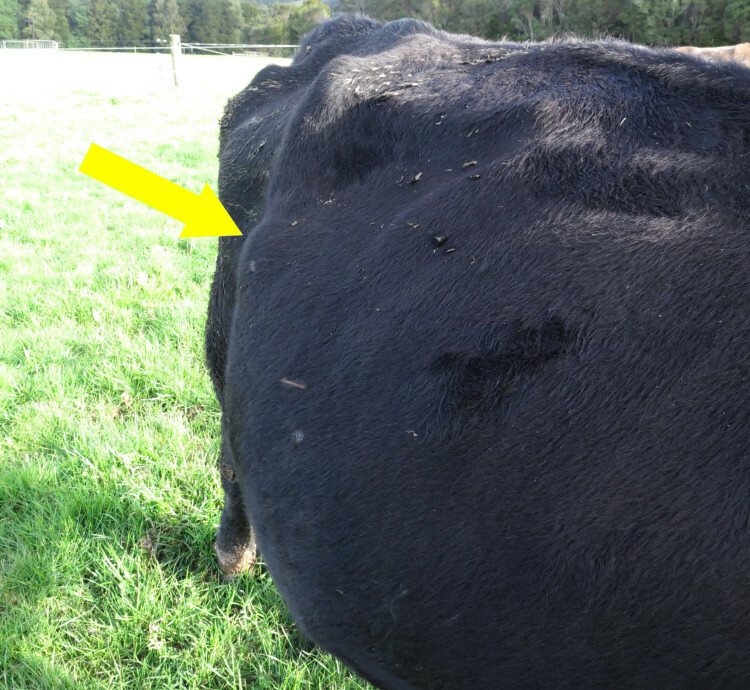 As Eva walked away from me through a gate to new grazing today, there was a huge lump of calf up by her right hip. I don't know which bit of animal it might be but it was there for some time. It's great fun seeing and feeling them moving inside their mothers. What hilarious faces! They spotted my movement in the kitchen when I brought the camera to the window. Elizabeth brought Jonathan and Char-Lien out for lunch and afterwards we went for a walk, soon joined by David (Stephan's sister Rachel's son) and Penny, who's little and between David and Elizabeth in the picture. Here they were all standing in the Back Barn while I opened the gate for the thin mob to come with us along the lane to the Blackberry paddock. 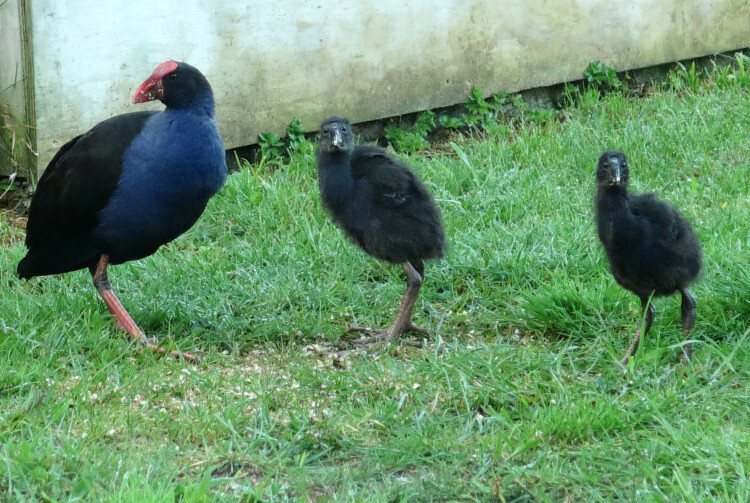 Penny was up and out in the early morning, naughtily chasing the Pukeko family across the paddock. David and Penny had come up for grand- (and great-grand-) mother Esther's funeral, which we all attended late this morning. Esther and Kelly lived in Diggers Valley, dairy farming, for years until they retired to Larmer Road, where Muriel also went to live when she left here. Stephan's sister Rachel, is married to Esther's son Murray. 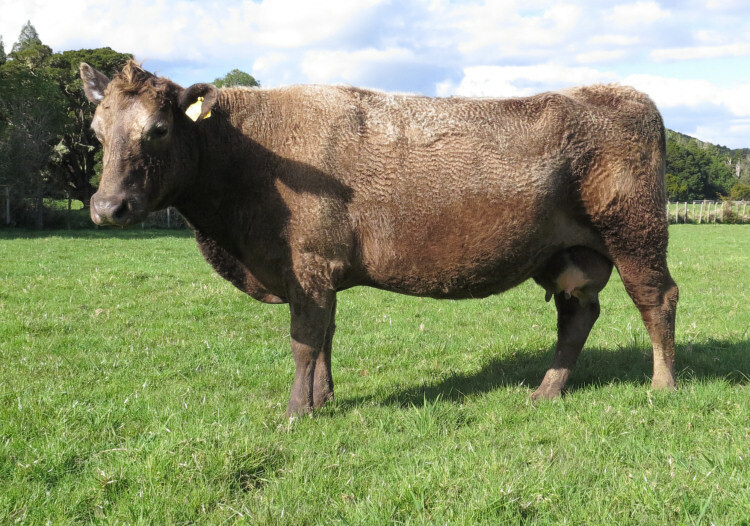 Every year I watch cows whose udders are developing more quickly than I think they ought to for the dates I expect them to calve. I have no doubt they got pregnant on the dates I recorded and to the recorded bulls but a shorter gestation might mean twins! I'm a worrier; it's just what I do. The two grey animals followed me out of the paddock and across into the Windmill. I am gradually moving them closer to the house for when I think they might start calving. 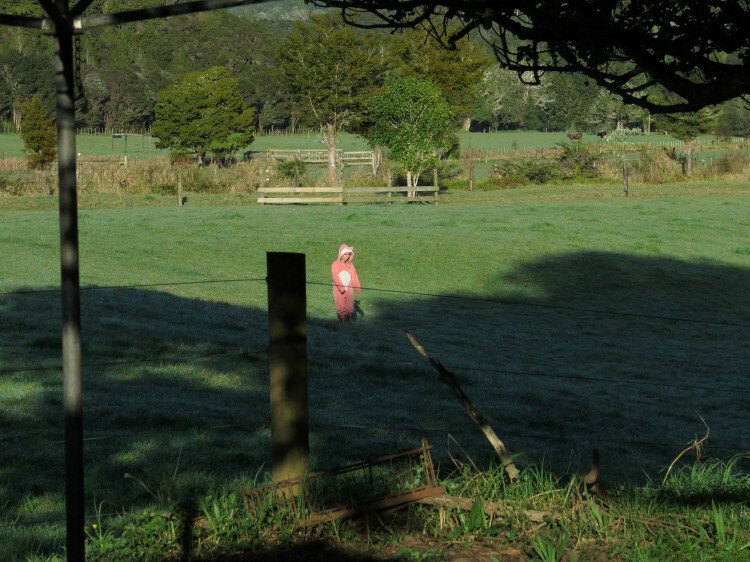 Eva ignored the request and stood down the end of the paddock. I went down and groomed her tail for a while and eventually prompted her to walk up the paddock and in to the new one. 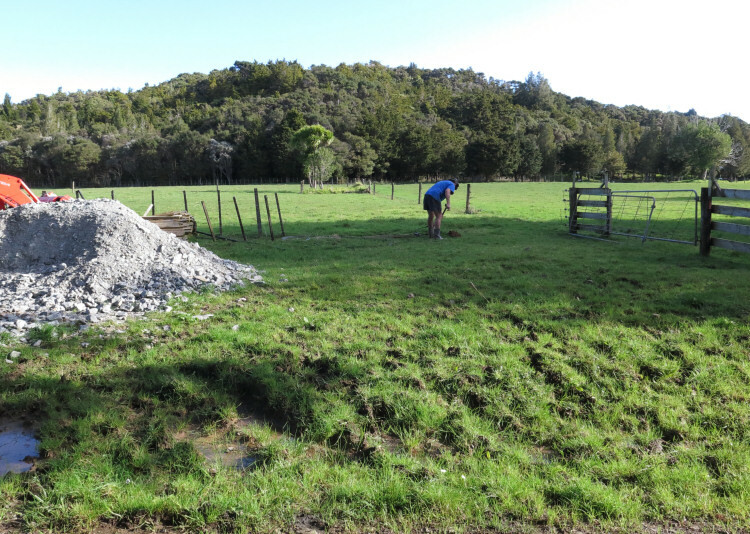 Stephan then got on with some fence alteration, prompted initially by the collapse of the strainer post where the gate was hinged. It fell over many weeks ago and I've avoided using the gateway since and we really do need it operational again. 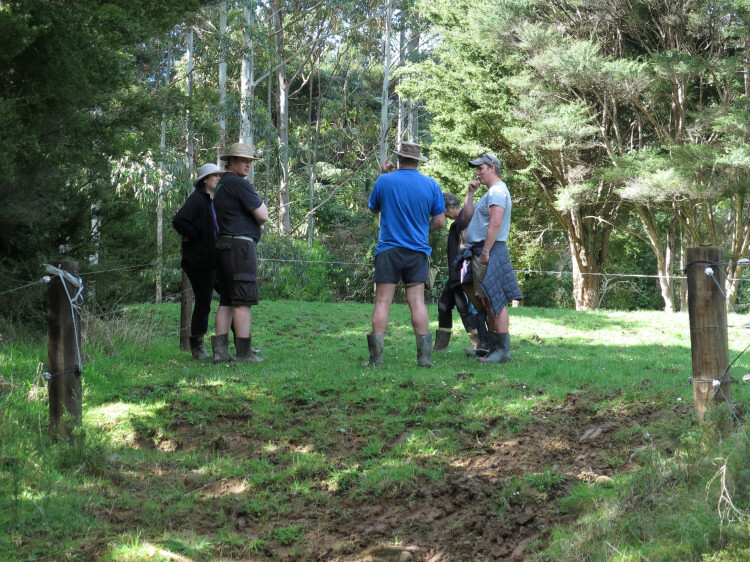 We have also long talked about altering this end of Flat 5d's fence, to take in some of the tall Kahikatea trees in whose shade the cows all gather by the fenceline in the summer. If we incorporate some of the trees in the paddock, there'll be better shade and shelter for them without so much crowding. 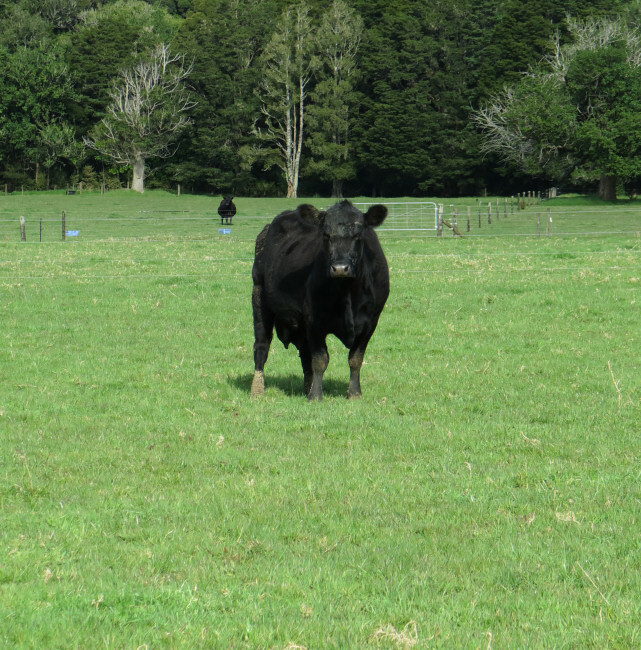 The annual Eva's Calving Date Competition has closed a little earlier than expected.